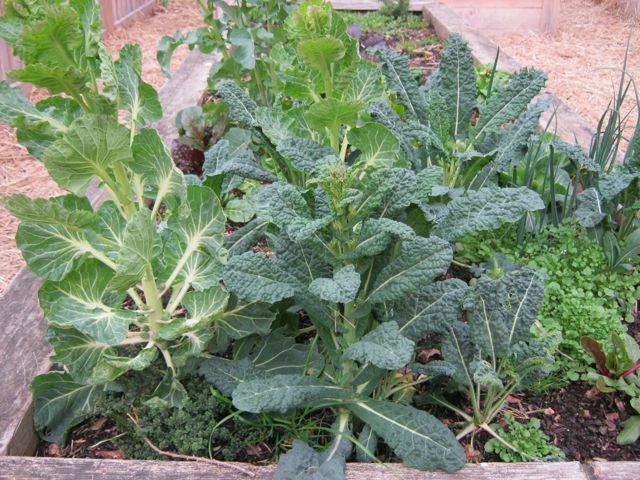 One of the best things we do at the Bagley Elementary School garden is grow food for the local food bank. We have a dedicated bed for this, the grandfather bed as we call it, since it is the one garden bed we kept when we remodeled the garden two years ago. Yesterday, with the sun out and the temperature in the upper 50’s I checked out how well the hardy greens had wintered over. We’re almost ready to do a final harvest of them so that we can replant the bed with the new seedlings that students have started under grow lights. I have to do the same thing at home with my collards before they bolt when (soon I hope!) the days get a tad warmer. While the weather hasn’t stayed warm, the days are noticeably longer. By the way, if you live in Seattle and need plant starts, I’ll be signing books at Tilth’s March Edible Spring Plant sale at Magnuson Park Hanger #30 on March 17th beginning about 9:30 AM.